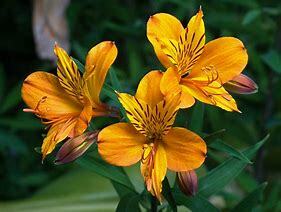 Forty years ago, Canadian florists started receiving shipments of alstroemeria. 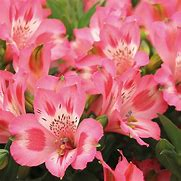 If you’ve ever seen the flower also known as Peruvian Lily when it’s just picked, all you see are tight buds, which are not very beautiful. With time, this pretty flower will open into a show of blooms that last an average of 2 to 3 weeks. 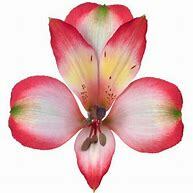 Neville MacKay, CAFA, PFCI, owner of My Mother’s Bloomers in Halifax, Nova Scotia, was one of the first florists to take a chance on the shy alstroemeria. 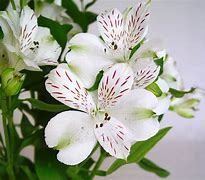 When customers would call inquiring about the “clumps of dead flowers” in their arrangement, he’d tell them, “Those are alstroemeria. Give them time to open. Those beauties last longer than a bad relationship– call me back in two weeks and let me know what you think then!” With patience, the buds do open, however closed buds are easier to transport home and give you more time to enjoy the process of blooming! Every flower has a hidden meaning, and this flower is no exception. 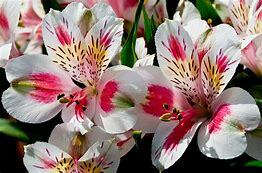 Alstroemeria symbolizes friendship and devotion, and the twists in the flower symbolize the trials and tribulations of friendships. 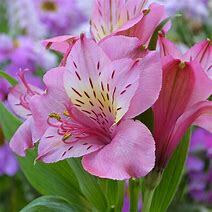 This alstroemeria reminds us of a beautiful outdoor phlox plant. ‘Bianca’ has very white petals with flecks of burgundy. ‘Revolution’ features a halo of red on each white petal.